HI! I hope everyone is enjoying their Saturday! Today's theme is TREES on the Less is More Challenge Blog. ( it's by a company called Northwoods Rubber Stamps). 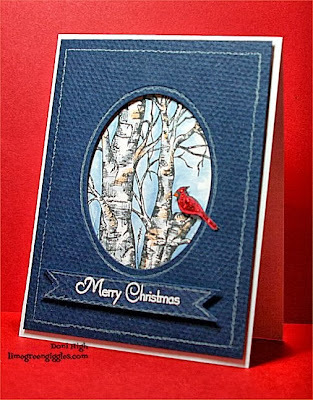 here and there on the trees and some super fine red glitter on the cardinal. For some reason that neat sparkly look just does not photograph well! with my copics (E-11, B91, C2, R49). my nestabilities oval to cut out a window. and to draw a line quarter inch in from the edge..
because it's a softer look and besides if I screwed it up you can erase colored pencil! Next I popped the navy panel up using thin pop dots. 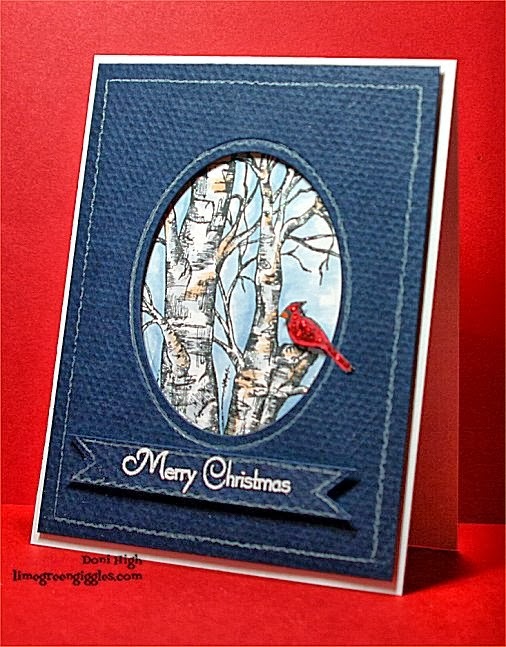 I colored and glittered another cardinal and popped it over the background one. cut it into a banner and popped it up under the cut out window...Done! This is simply fabulous Doni! Love the bark on these ! Just bought this stamp...love your idea better than the one I had. Did you emboss the tree's?